Bring your hat, shades, sunscreen and camera to New Mexico and prepare to be amazed by Alamagordo’s White Sands, a high-desert wonderland. Walk upon the huge dunes and try to spot the creatures that have adapted over time to the unique environment. Or marvel at how plant life survives in the constantly shifting terrain. If those things don’t float your boat, try sledding down mountains of sand. Astronauts who have viewed it from space say there is no other location on Earth quite like it. If this strange but spectacular landscape fails to impress, visit the White Sands Missile Range, which has been operational ground zero for developing rocket and missile technology and was used to develop and test the first atomic bomb. Being able to see examples of that important history should hold the interest of most. Bring the kids and grandkids too. Everyone will find plenty to do. We started our visit at the White Sands National Monument’s visitor center. There are many exhibits inside and outside the building. The exhibits are informative, but viewing a video that is shown every half-hour tied everything together. After watching the video, we went back and discovered that many of the exhibits were even more meaningful. Adjacent to the center is a paved roadway that extends eight miles into the 275-square-mile White Sands National Monument area. The road is well-maintained and constantly cleared of drifts. They use heavy equipment to move the drifting sand, much as a snowplow is used for clearing snow. There are plenty of parking areas set aside for pulling off at trailheads to take photographs, enjoy a picnic, fly a kite, or sled down some of the highest dunes. Just over two miles in, we came to a parking area, restrooms and the beginning point of the one-mile Dune Life Nature Trail. The trail is moderately difficult, but well worth the effort. It is self-guided, with family-oriented interpretive signs featuring Katy the Kit Fox posted all along the way. Those who walk the trail will learn a great deal about the dunes; also about how the plants and animals of the area have adapted to survive. There are many opportunities to take photographs of landscapes that aren’t found anywhere else. Just over four miles from the visitor center is another parking area, restrooms, and the beginning point for the daily one-hour Sunset Stroll. A park ranger narrates a walk through the dunes that begins about an hour before sunset. The National Park Service offers a variety of hikes and other programs during the year. Details can be found at the park service website, nps.gov/whsa. The chain of events that created this spectacular natural wonderland began 250 million years ago. Erosion caused waterborne gypsum to flow into a shallow sea. The marine deposits settled and hardened to stone. Some 70 million years ago, about the same period when the Rocky Mountains were formed, those deposits were forced upward. A giant dome was formed. About 10 million years ago, the center began collapsing, which resulted in what is now known as the Tularosa Basin. Remains of the rim are now known as the San Andres and Sacramento mountains, which rise steeply around the basin. Gypsum, the hydrous form of calcium sulfate, dissolves in water and was carried down into the basin, where there was no outlet. The huge deposits dried and hardened. Over time, strong southwesterly winds began to erode the huge mass. Chunks were broken down into rice-sized bits, and those were broken down to sand and powder. Constantly shifting dunes were created by the blowing winds. 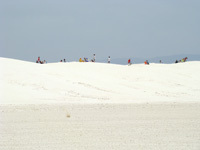 Thus the White Sands area was created at the northern end of the Chihuahua Desert. The basin is at an average elevation of 4,000 feet; the surrounding mountains steeply rise to well over 8,000 feet. For more than 10,000 years, the dunes provided inspiration and physical sustenance to those who learned to survive in its harsh environment. Early inhabitants hunted mammoths around ancient Lake Otero, and collected edible plants from the dunes. President Herbert Hoover declared the area a national monument in 1933, and today as many as 600,000 people come to see it every year. It is a living laboratory that provides insight into the past and future. It affords opportunities to—among other things—recognize the role of drought-resistant microbes that help plants grow in a waterless environment; also, to better understand gypsum dunes that exist on Mars. There are 44 species of mammals, 26 of reptiles, six amphibians, and 100 types of insects living in the monument area. In order to survive, many have evolved with shades of white to better blend in. One of the most bizarre forms of animal life in the Tularosa Basin is a non-native species introduced from Africa by the New Mexico Department of Game and Fish in 1969 for sport hunting. The oryx is an antelope with extremely long, twisted horns. Even mountain lions give them a wide berth. My wife, Gayle, and I were told by one local resident that he saw a mountain lion impaled on the horns of an oryx. With no natural predators, they have proliferated, and are frequently seen in the wild. There are several options for viewing the dunes. Besides driving, hiking and biking, you can try ballooning and skydiving. We chose to drive up a steep and serpentine route (not recommended for motorhomes) from the Tularosa Basin to the small village of Cloudcroft, at an elevation of 8,600 feet. We found a viewing platform that extends out over a steep canyon. 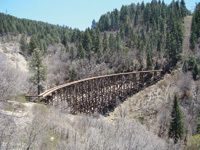 The platform overlooks an old railroad trestle that was once used by trains bringing high rollers from the heat of the desert to the cool mountain climate at Cloudcroft. The view of the White Sands far below is impressive, and binoculars can enhance the experience even more. Of course the White Sands area is well-known for its key role in space history. Virtually every type of rocket and missile the United States has produced since the early 1940s was developed and tested here. The Manhattan Project that created the world’s first atomic bomb began here in 1942, and the first bomb was tested here on July 16, 1945. You can learn about this at the New Mexico Museum of Space History in Alamogordo and at the White Sands Missile Range Museum. The New Mexico Museum of Space History contain exhibits on everything from early rockets to the International Space Station and is home to the International Space Hall of Fame. Twenty-eight countries have furnished artifacts and exhibits. Just inside the main gate of the U.S. Army’s White Sands Missile Range is a museum that is open to civilians who have government-issued photo ID. The Trinity site, where the first atomic bomb was tested, is open to the public only once a year, in April. There are many RV parks in and around Alamogordo, which is about 15 miles northeast of the White Sands National Monument. 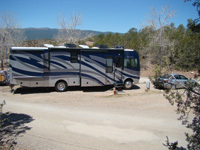 My retirement from the military allowed us to stay at an RV park at nearby Holloman Air Force Base. The price was right, and it put us about in the center of all that we wanted to see in the region. We urge anyone who can, to visit and explore this area. We are sure it will be a worthwhile experience, and one that won’t be encountered anywhere else on earth. Ken Reid, an RVer for more than 40 years, lives in Modesto, California. 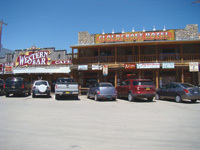 White Sands National Monument: The monument’s visitor center is about 15 miles southwest of Alamagordo along Highway 70. The visitor center is open every day except Christmas. Hours of the park and of Dunes Drive vary by season, and there are occasional road closures because of weather. For information, visit nps.gov/whsa/index.htm. The National Park Service also has a website that explains how the white sands were formed. The address is nature.nps.gov/geology/parks/whsa. New Mexico Museum of Space History: The museum is at 3198 State Route 2001 in Alamagordo. It is open daily except Thanksgiving and Christmas. 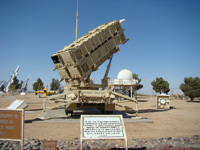 For information, visit nmspacemuseum.com. Alamagordo Museum of History: The Tularosa Basin Historical Society Museum operates this museum at 1301 N. White Sands Boulevard next to the Alamagordo Visitor Center. For information, visit alamagordohistory.com. White Sands Missile Range Museum: A government-issued photo ID is required to enter this museum just inside the main gate of the missile range. For information, visit wsmr.army.mil. Cloudcroft: The village of Cloudcroft provides an elevated view of the white sands and the Tularosa Basin. The route to the village is quite steep, so motorhomes are not advisable. For information, visit cloudcroft.net.